In 1878 Radbourn joined the Peoria Reds, a barnstorming team, as their right fielder and "change pitcher". No substitutions were allowed at the time so if the starting pitcher became ineffective in the late innings the change pitcher, usually playing right field, would exchange positions with the starter to try to save the game. In 1879 he signed with Dubuque in the newly formed Northwest League. He finally made the major leagues in 1880 as second baseman, right fielder and change pitcher for the Buffalo Bisons of the National League. He played in six games, batted .143, never pitched an inning, but practiced so hard he developed a sore shoulder and was released. When he recovered he pitched for a pick-up Bloomington team in an exhibition game against the Providence Grays. He impressed everyone so much that Providence signed him on the spot for a salary variously reported as $1,100 or $1,400. As a starting pitcher for the Providence Grays (1881–1885), Boston Beaneaters (1886–1889), Boston Reds (1890) and Cincinnati Reds (1891), Radbourn compiled a 309–194 career record. In 1884 he won the National League's pitching Triple Crown with a 1.38 earned run average, 59 wins and 441 strikeouts. His 59 wins in a season is a record which is expected never to be broken because no starter has made even as many as 37 starts in a season since Greg Maddux in 1991. Also, his 678 2⁄3 innings pitched in 1884 stands at second all-time, behind only Will White (680), for a single-season. It, too, is a record that will most likely never be touched. It was made possible by the mid-season expulsion of the Grays' other main pitcher, Charlie Sweeney. When Providence failed to win the pennant at the end of the 1883 season the franchise was on shaky financial ground. Ownership brought in a new manager, Frank Bancroft, and made it plain: win the pennant or the team would be disbanded. ↑ McKenna, Brian. 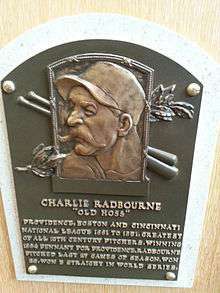 "Old Hoss Radbourn". The Society for American Baseball Research Biography Project. The Society for American Baseball Research. Retrieved October 1, 2011. ↑ Jazayerli, Rany (March 2, 2004). "A Brief History of Pitcher Usage". Baseball Prospectus Basics. Baseball Prospectus. Retrieved October 20, 2016. ↑ Under modern rules, a team that is unable to field nine players would have to forfeit the game, but a substitution would be allowed in modern baseball. 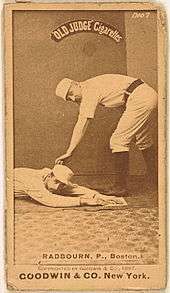 ↑ "1883 Providence Grays – Statmaster Pitching Results". Retrieved 2011-07-04. ↑ "Radbourn, Charles". National Baseball Hall of Fame Museum. ↑ Quinion, Michael (2011). "Charley horse". World Wide Words. Retrieved June 17, 2011.